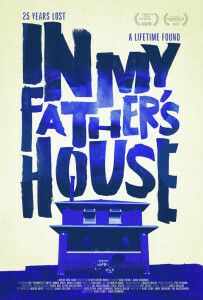 IN MY FATHER’S HOUSE tells the story of the career rise, fall and potential artistic return of Che “Rhymefest” Smith as it chronicles his sincere but often-fraught journey to build a future for his own family by reconnecting with his traumatic past. In My Father’s House goes well beyond exploring the journey of reconnecting with absentee father, Brian Tillman. Rhymefest and the entire Smith family virtually invite you into their home as they share about his journey in the music industry, navigating his own struggles with fatherhood and more. The film provides intimate access to this complex hip-hop artist at a time of both personal and professional redemption. Award winning hip-hop artist and writer – co-writer of the 2015 Oscar winning song “Glory” and 2005 Grammy winner “Jesus Walks” with Kanye West – Che “Rhymefest” Smith, is the subject of the critically acclaimed documentary film about fatherhood and personal redemption. The film debuted in April at the Tribeca Film Festival in the World Documentary Feature Competition. IN MY FATHER’S HOUSE is directed by Emmy, Gotham and Independent Spirit Awards nominated filmmakers Ricki Stern and Annie Sundberg (THE DEVIL CAME ON HORSEBACK, THE TRIALS OF DARRYL HUNT, JOAN RIVERS: A PIECE OF WORK, KNUCKLEBALL!!). Sundberg and Stern join us for a conversation on the redemptive power of family, seeing our parents through the lens parenthood and unconditional love. This entry was posted in documentary, drama, dramedy, Film School interview, Indie by admin. Bookmark the permalink.